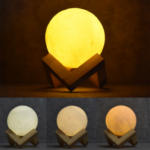 The Moon Lamp adopts 3D printing technology to show you a real moon with rough surface, giving you a real effect and let you enjoy the moon beauty in your house. 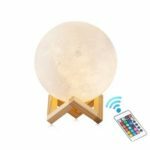 With 16 light colors, dreamlike and creative decorative lights, perfect decorative lights for Christmas, birthdays, party, wedding, anniversary, home and outdoor, a nice gift for your kids, friends or lover. 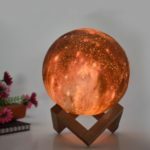 This moon lamp looks much better than the 3D printed Moon Lamp, because it is empowered by precision 3D technology, and exquisitely crafted according to NASA satellite images of the moon. The surface is vivid with a realistic touching of the detailed crater and mountains. 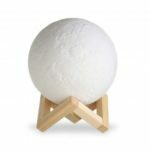 It is an interesting experience to operate the moon lamp just by touch or remote control, no button. 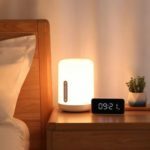 The funniest thing is that the lamp will change colors every time by gently tapping, your kids will love it. It is perfect gift to friends in Christmas or birthday! 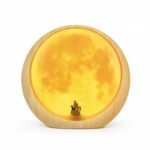 Pretty to decorate your room by holding on a natural wood bracket, no space occupation, just creating a warm and romantic space for you. It is a fantastic gift for all holiday.